A half curl is kind of mixing a Baton Flourish with a Helicopter spin. When doing a helicopter spin, get the center of the devilstick to land on the right handstick. As the devilstick starts to spin keep it balanced on the handstick. You will want to keep the handstick and devilstick perpendicular with each other. You also need to keep the handstick as horizontal as possible to prevent the devilstick from rolling. Let the devilstick do one complete revolution as it is balanced on the handstick. 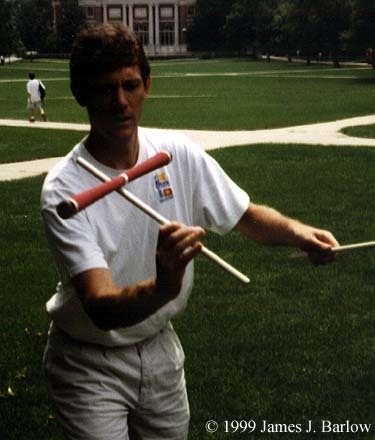 The handstick will do a baton flourish with the devilstick balanced on it. You can then go back into a Helicopter or a Helicopter Tap. In the picture I am at the halfway point. I will keep the devilstick on the handstick as it continues the helicopter spin. Once you can do a half curl with each hand try passing the devilstick from one hand to the other after each half curl. It looks real nice, and if you can place the devilstick on the handstick a little off center then you can give the devilstick a little momentum to keep it spinning as it turns.